Lindsey's love for horses was immediate starting as early as age 2. Her parents supported her by getting her a pony as soon as she could hold herself in the saddle. In many ways her childhood was defined on the backs of all the wonderful equine spirits that came into her life. Art was also an early childhood passion, and Lindsey spent a lot of time painting or drawing horses. As time went on, her two interests for horses and art became more intertwined. 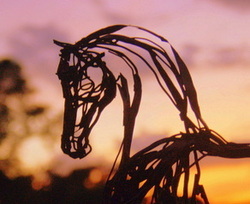 Creating horses in different media was a way to express Lindsey's pure love for the horse, and at Bennington College, she focused specifically in sculpture to improve her craft. After college, Lindsey stayed in Vermont, where by luck the rivers and the driftwood were abundant. Lindsey was working for a horse farm at the time when the blend of art and horses took shape in the first driftwood forms. After many years of enthusiastic trial and re-building, Lindsey developed a system to combine strength and freedom in her driftwood sculptures. Working with wood to create visually stimulating pieces of art is both challenging and rewarding. Each piece is a new journey as Craig works to transform the raw material into new creations altogether. Inspiration for his art comes from nature, patterns, symbolism, and the grain of the local and exotic wood that he works with. The rich, contrasting wood patina creates the canvas for images that are delicately burned into the wood. 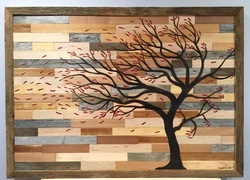 The natural colors of the wood and careful, yet bold, burning techniques combine to create intriguing, statement-making, one-of-a-kind wood designs for all decors. Craig is a local artist living in Tariffville and teaching in West Hartford. To purchase artwork or inquire about ordering a custom piece for your home or business, please contact Craig to start the creation process.